There is nothing more mind-blowing than a great life hack video. It’s like this light bulb goes on in your head and you realize that you’ve been doing an unnecessary amount of work your whole life when there is a simple, easy, genius solution you never imagined. And suddenly your entire life gets so much easier in an instant. Some of my favorite life hacks can be found here 30 simple hacks and here 45 kitchen hacks, the most recent life hack video I discovered has some crazy brilliant ideas that leave even those behind. 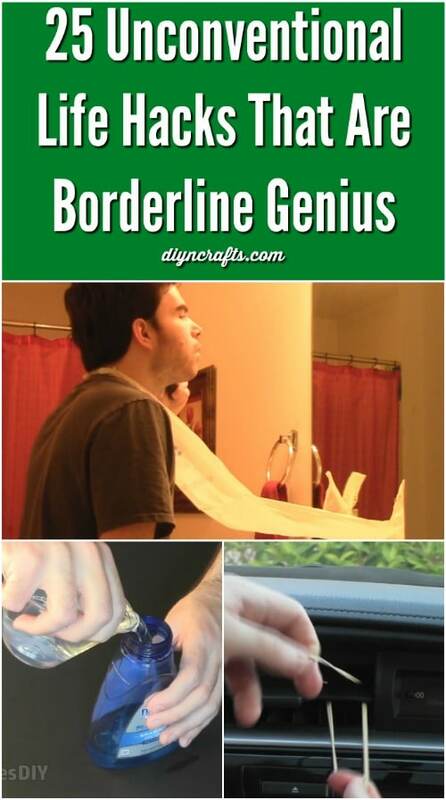 This video has a total of 25 awesome life hacks. Lately I have been featuring a lot of videos by JamesDIY. I love this guy’s videos—his presentation style is great, and he has a tendency to present ideas that actually work and are genuinely useful—not totally obscure hacks that you will never have a real opportunity to use. My favorite hack is one where you use a rubber band and the air vent in your car to attach your mobile device to the dash. That way you can consult your GPS, make calls and more without fumbling around with the phone. You’ve effectively augmented your car’s dashboard—this is the next best thing after a built-in GPS! The video’s description has a full list of hacks with links so that you can jump to the one you are interested in. I recommend watching the entire video though; you will learn so much! How great is the method for peeling hard cooked eggs!love it! Also am impressed with neat way to cut corn off cob (I’ve tried many methods for years, but this works!). And since we use Parmesan cheese often, will try the plastic lid on a bottle. Thanks!